Five human skeletons were exhumed on Tuesday. Two more remains of the victims were recovered on Wednesday. The Judicial Medical Officer from Anuradhapura was not present on Wednesday. 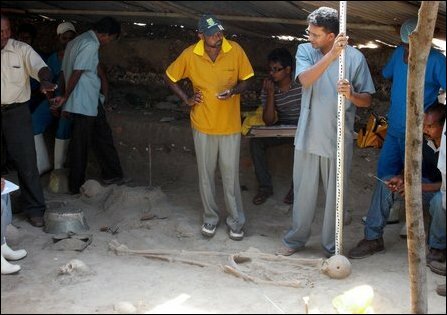 All the skeletons recovered so far have been locked in 18 boxes and preserved at Mannaar hospital, the SL police said. The extent of the killing field is not yet established. 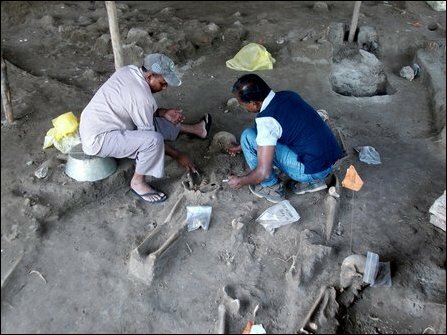 The forensic excavations are to continue on Thursday, news sources in Mannaar said. The killing field is situated close to the temple road that turns from Mannaar - Jaffna Road to Thirukkeatheesvaram temple. During the times of war, a major SL military camp was situated at the site and the mass grave site came under the so-called high security zone of the occupying SL military. Hundreds of innocent civilians were slain by the Sinhala military during the Rana Gosha military operation. Many people were also reported missing during that time.